TL;DR Why is the first line of every stanza broken after the first character when using astanza from the reledpar / reledmac package? And why is the title missing? Now my problem is that when I compile my MWE locally the first line of every astanza is broken after the first character. Also the title of every astanza is missing. See the following screenshot or PDF. I tested this with my local LaTeX installation (MikTex) and TexMaker as well as TexStudio. The reledmac version I have installed locally is 2.24.0 from the 18th of August 2017. I also tried compiling this MWE on sharelatex with all available compilers and always have the same result. 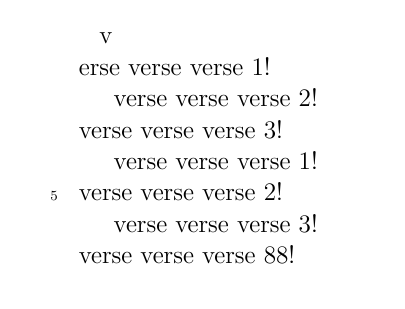 If I use overleaf to compile this, it works totally fine. See the following screenshot or PDF. Now my problem is, that overleaf is really slow and very hard to debug (my output document has around 100 pages). Therefore I can not go on with working only on overleaf. I really do not understand why it is only working on overleaf. This is my MWE. Every help is appreciated. After reading the helpful comment from Maïeul and having a look at this post I found out that there were two different versions of reledmac installed by MikTex. The correct version (2.24.0) was installed via the MikTex Package Manager (Admin), but this was not the version that was used by Latex. I also had to use the MikTex Package Manager (without the --admin flag) to update the package for the currently logged in user. After doing this the problem was solved.